Nasal physiology is greatly dependent on the physical structure of the nose. Seemingly individual aspects of the nasal cavity collectively affect nasal function. This article reviews pertinent basic nasal anatomy, nasal physiology, and objective measurements of nasal airflow (see image below). An overview of topics relevant to nasal airflow when performing rhinoplasty is also included. (A) Laminar nasal airflow at a low inspiratory flow rate. (B) Turbulent nasal airflow at a higher inspiratory flow rate. Illustration by William E. Walsh, CMI; Northwestern University medical student and certified medical illustrator. External nasal anatomy can best be considered in structural thirds. The upper third includes the paired nasal bones. The middle third is composed of the stiff paired upper lateral cartilages fused to the septal cartilage in the midline. The lower third of the nose consists of softer lower lateral cartilages. From a functional standpoint, the lower and middle thirds of the nose play an important role in the nasal valve. The external nasal valve is defined laterally by the nasal ala and medially by the septum, whereas the internal valve is defined by the attachment of the upper lateral cartilage to the septum, which forms an angle of approximately 15°. The anterior face of the inferior turbinate defines the lower boundary of the internal nasal valve. The entrance of the nasal cavity consists of the piriform aperture, which is defined as the frontal process of the maxillary bone, floor of the nose, and lateral fibrofatty tissue. One theory regarding the efficiency of heat exchange relates to the location of the sphenopalatine artery. The sphenopalatine artery courses anteriorly in the nasal cavity over the turbinates, whereas air flows in a posterior direction forming a countercurrent exchange. Thus, the 2 opposing motions create a more efficient heat exchange process. However, this process remains imperfect, and as much as 10% of heat loss occurs in the nose. The nose may serve as a contributing factor in voice modification. Previous authors have noted that nasal aerodynamics may have a role in modifying high-frequency sounds and consonants. Nasal aerodynamics contribute to the olfactory system. The active process of sniffing allows environmental particles to reach the olfactory system, which is located at the skull base. The term nasal valve most often refers to the internal valve, which is the limiting region of airflow. The nasal valve is defined as the lower edge of upper lateral cartilages incorporating the anterior ends of the inferior turbinates adjacent to the nasal septum. The angle between the septum and the upper lateral cartilage is 10-15°. The nasal valve is usually located less than 2 cm distal in the nasal passageway, approximately 1.3 cm from the naris. The average cross-sectional area is 0.73 cm2. Nasal resistance is composed of 2 structural elements; the first layer is composed of underlying bone, cartilage, and muscle, and the second layer is the overlying mucosa. Both environmental and intrinsic factors affect nasal resistance. Factors decreasing resistance include exercise, sympathomimetics, rebreathing, atrophic rhinitis, and erect posture. Exercise causes sympathetic vasoconstriction and contraction of the alae nasi, increasing the capacity of the nasal passages. Rebreathing causes increased arterial carbon dioxide levels, which results in nasal vasoconstriction and reduction in nasal resistance. Going from a supine to an upright position decreases jugulovenous distension and nasal airway resistance. The nasal vestibule is the first component of nasal resistance. The nasal vestibule is composed of compliant walls that are liable to collapse from the negative pressures generated during inspiration. The vestibule has been termed the external nasal valve. Studies have shown 30 L/min is the limiting flow during inspiration at which nasal airway collapse occurs in this area. The nasal vestibule is primarily supported by alar cartilage and musculofibrous attachments. Despite the tendency, airway collapse is prevented by activation of the dilator naris muscles during inspiration. During expiration, positive pressure is the driving force for nasal vestibule dilation. Bachmann and Legler (1972) stated that the nasal valve area occurs at the entrance of the pyriform aperture, which corresponds to a major site of resistance anterior to the tip of the inferior turbinate. The valve area is dynamic; venous erectile tissue of the turbinate and septum can cause marked obstruction. The clinical relevance of the nasal valve relates to its location. Treatment directed at the inferior turbinate will have marked effects on nasal airway resistance; trimming of the septum posterior to the valve area has fewer effects on resistance. A positive Cottle test result may signify resting narrowing of the nasal valve. A Cottle test result is considered positive if the soft tissue and nasal vestibule are lateralized, increasing the valve angle and airflow. Evaluation of nasal obstruction may consist of a physical examination, rhinoscopy with adequate light and a nasal speculum, chemical analysis, imaging studies, and rhinomanometry. Chemical analysis may include neutrophil counts relating to the presence of infection, eosinophil counts in allergic conditions, and mast cell counts in food allergy. Imaging studies include CT scans and MRI. Rhinomanometric techniques include passive, active, and acoustic methods. Mathematically, a Reynolds number greater than 2000 is equated with turbulent flow. The presence of laminar or turbulent flow in the nasal passageway is pertinent to the physiology of air exchange (see image below). Inspiratory flow is generally considered as laminar flow. Inspiration lasts approximately 2 seconds and ranges from 12-18 m/s at the nasal valve area during quiet respiration. Expiratory flow has more components of turbulent flow. Turbulent flow facilitates the exchange of heat and moisture. Turbulent flow occurs when transnasal pressures exceed 40-80 Pa. Expiration lasts approximately 3 seconds. Turbulent flow requires more energy expenditure but results in better mixing, which contributes to nasal function. Turbulent flow can prevent clearance of air, which can cause a sensation of obstruction regardless of nasal passage patency. Nasal resistance is important for respiratory physiology. Automatic positive end-expiratory pressure (Auto-PEEP) occurs from the work that is involved in overcoming resistance during expiration. 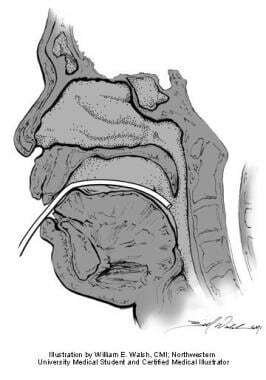 In postlaryngectomy patients, alveolar collapse is imminent with the loss of nasal airway resistance and Auto-PEEP. The glottis acts as an internal valve to regulate expiratory airflow, thus allowing alveoli to stay open longer during expiration and allowing continued gas exchange. Postnasal rhinomanometry is another form of measurement. Posterior rhinomanometry uses a pressure sensor in the mouth. In this method, total flow from both nasal passages can be measured together, or each nasal passage can be measured separately. One disadvantage of posterior rhinomanometry is that not all patients are able to relax the soft palate sufficiently. In addition, an oral pressure sensor may be prone to artifact due to movement in a patient's mouth. A significant number of patients seem to be unable to be studied using rhinomanometry for various reasons. The use of a facemask during rhinomanometry rather than a nasal cannula may be more accurate; the nasal cannula may erroneously dilate the nasal airway. Passive rhinomanometry relies on the production of airflow from an external source. With a constant pressure, the flow is measured from the nasal mask. However, it has been noted that external introduction of airflow causes "reflex-evoked changes of the thickness of nasal mucosa.". Accordingly, this method has found little clinical application. Anterior rhinomanometry measures the transnasal pressure (see image below), which is the difference in pressure from the naris to the nasopharynx. In this method, a pressure probe is placed at the opening of the nostril not being tested. The nasal passage acts as an extended tube and assumes the airway pressure of the nasopharynx equals the pressure at the naris of the nontested side. Total resistance can then be calculated from 2 unilateral measurements. However, anterior rhinomanometry cannot be used to measure airway resistance in patients with septal perforations. Anterior rhinomanometry. Illustration by William E. Walsh, CMI; Northwestern University medical student and certified medical illustrator. Postnasal rhinomanometry uses a pressure sensor placed along the floor of the nose into the nasopharynx (see image below). A separate pressure transducer is located at the entrance of the nasal cavity. Transnasal pressure differences are then measured. Postnasal rhinomanometry. Illustration by William E. Walsh, CMI; Northwestern University medical student and certified medical illustrator. Posterior rhinomanometry. Illustration by William E. Walsh, CMI; Northwestern University medical student and certified medical illustrator. Rhinomanometry yields flow-pressure curves. Airflow increases with increased transnasal pressure, but higher pressures may yield turbulent flow secondary to the effects of airway resistance. Turbulent flow results in a limitation of flow generated despite greater transnasal pressure differences. Laminar flow is based on a linear relationship between flow and pressure. 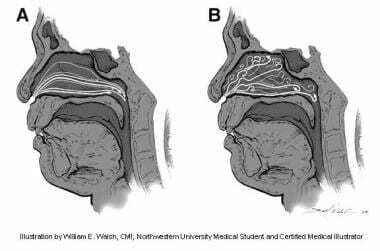 As nasal obstruction occurs, the amount of flow able to be generated plateaus sooner even with greater pressure changes. The clinical value of rhinomanometry relates to degree of obstruction. The 2 major types of obstruction are mucosal hypertrophy and structural deformity. Rhinomanometry is performed with and without decongestion and total resistance is calculated. Resistance above 0.3 Pa/mL/s is usually symptomatic. The one caveat of rhinomanometry is that no resistance can be measured when the nasal passage is completely obstructed. Mucosal vasodilation from pathogen-induced histamine release may cause allergic nasal obstruction. Inflammation and drainage from sinusitis may contribute to obstruction. Septal deviation is a common cause of obstruction. The relative size of turbinate hypertrophy is important because 50% of airflow is in the middle portion of the airway. Turbinates adjacent to a septal perforation may hypertrophy secondary to nasal airway turbulence, causing further airway resistance. Valvular collapse secondary to insufficient cartilaginous support may cause nasal obstruction. In addition, rhinoplasty may be the significant factor in iatrogenic nasal obstruction. A successful rhinoplasty is both aesthetically and functionally sound. The success of a postoperative external nose is diminished when the patient is unable to breathe through his or her nose. A narrowed supratip area due to overresection of the upper lateral cartilages may cause significant nasal obstruction. The periosteum of the bony nasal vault serves to hold the nasal bones in place after osteotomy. Sachs states that getting the elevation of the periosteum to be exact is crucial. Periosteal elevation should begin 2 mm above the caudal edge of the nasal bones and proceed laterally to the extent that is half the distance of the width of the remaining nasal bones after hump removal. Osteotomies may be the most destructive portion of the rhinoplasty, so careful planning is crucial. One approach first focuses on the glabellar area. Sachs believes that most glabellar regions do not need narrowing; thus, osteotomies do not have to be carried to their most superior extent in the nasal-frontal suture line. Sachs also states that periosteal elevation should be minimized. Insertion of the osteotome is also important to prevent the formation of scarring of the anterior vestibule; a nasal speculum should be used to retract the nasal vestibule as laterally as possible before insertion of the osteotome along the piriform aperture. Helal et al studied the relation of internal and external osteotomies on their effects on the internal nasal valve. The authors found that both types of osteotomies cause narrowing of the internal nasal valve, but neither type of osteotomy caused more narrowing than the other. The nasal valve is an important consideration in rhinoplasty. In particular, 2 incisions have great potential to change the dynamics of the valve. The intercartilaginous incision and the disarticulation of the upper lateral cartilage from the septum have the potential to increase nasal resistance. The caudal aspect of the upper lateral cartilage should not be excessively trimmed. The nasal valve functions by moving into the vestibule as airway resistance increases. This movement is hampered when insufficient mucosa remains for coverage of the caudal aspect of the upper lateral cartilages. During alteration of the lower lateral cartilages, care should be taken not to resect too much of the most caudal aspect of the cartilage. Overresection in this area leads to alar collapse and nasal obstruction. Sachs (1989) also writes that an important area of the septum to consider is the upper bony septum in the area of the perpendicular plate of the ethmoid. Sachs states that this area may cause nasal obstruction and prevent inward displacement of the nasal bones during osteotomy. Correction of the inferior portion of the septum is also important. Rhinoplasty that includes alar base resection moves the sides of the nose medially, and the turbinates can be in contact with previous septal deflections. In conclusion, the ability to alter the physical structure of the nose has notable potential for changing a patient's nasal airflow. Care must be taken to consider the dynamics of the nasal airway and preserve its function. What is significance of nasal aerodynamics? What is external nasal anatomy? What are the physiologic functions of the nose? What is the role of airway resistance in nasal aerodynamics? How is nasal obstruction evaluated? What are the flow mechanics of nasal aerodynamics? What is the clinical value of rhinomanometry? What causes of nasal obstruction? What causes nasal obstruction following rhinoplasty? What is the role of the nasal valve in nasal aerodynamics? What is the role of the nasal tip in nasal aerodynamics? What is the role of the septum in nasal aerodynamics? How is nasal obstruction caused by rhinoplasty corrected? Kerr A, ed. Rhinology. Scott-Brown’s Otolaryngology. 6th ed. Oxford: Butterworth-Heinemann; 1997. Li C, Jiang J, Kim K, et al. Nasal Structural and Aerodynamic Features that may Benefit Normal Olfactory Sensitivity. Chem Senses. 2018 Feb 21. [Medline]. Bailey B, ed. Nasal function and evaluation, nasal obstruction. Head and Neck Surgery: Otolaryngology. 2nd ed. New York, NY: Lippincott-Raven; 1998. 335-44, 376, 380-90. White DE, Bartley J, Nates RJ. Model demonstrates functional purpose of the nasal cycle. Biomed Eng Online. 2015 Apr 24. 14(1):38. [Medline]. [Full Text]. Cummings C. Otolaryngology: Head and Neck Surgery. St. Louis, Mo: Mosby Year-Book; 1999. 801-6, 816, 820. Myers AD, ed. Biological Basis of Facial Plastic Surgery. New York, NY: Thieme Medical Publisher; 1993. Cole P, Forsyth R, Haight JS. Effects of cold air and exercise on nasal patency. Ann Otol Rhinol Laryngol. 1983 Mar-Apr. 92(2 Pt 1):196-8. [Medline]. Silva EN. The Relation Between the Lower Lateral Cartilages and the Function of the External Nasal Valve. Aesthetic Plast Surg. 2019 Feb. 43 (1):175-83. [Medline]. Sasaki CT, Mann DG. Dilator naris function: a useful test of facial nerve integrity. Arch Otolaryngol. 1976 Jun. 102(6):365-7. [Medline]. Rivron RP, Sanderson RJ. The voluntary control of nasal airway resistance. Rhinology. 1991 Sep. 29(3):181-4. [Medline]. Bachmann W, Legler U. Studies on the structure and function of the anterior section of the nose by means of luminal impressions. Acta Otolaryngol. 1972 May. 73(5):433-42. [Medline]. Tan M, Whitcroft KL, Mehta N, Schilder A, Leung TS, Andrews P. Investigating the Nasal Cycle Using Unilateral Peak Nasal Inspiratory Flow and Acoustic Rhinometry Minimal Cross-Sectional Area Measurements. Clin Otolaryngol. 2019 Feb 15. [Medline]. Bridger GP, Proctor DF. Maximum nasal inspiratory flow and nasal resistance. Ann Otol Rhinol Laryngol. 1970 Jun. 79(3):481-8. [Medline]. Grymer LF, Hilberg O, Elbrond O, et al. Acoustic rhinometry: evaluation of the nasal cavity with septal deviations, before and after septoplasty. Laryngoscope. 1989 Nov. 99(11):1180-7. [Medline]. Grymer LF, Hilberg O, Pedersen OF, et al. Acoustic rhinometry: values from adults with subjective normal nasal patency. Rhinology. 1991 Mar. 29(1):35-47. [Medline]. Nishijima H, Kondo K, Yamamoto T, et al. Influence of the location of nasal polyps on olfactory airflow and olfaction. Int Forum Allergy Rhinol. 2018 Feb 2. [Medline]. Battisti AS, Pangia J. Sinusitis. Hosp Pract. 2018 Jan. 14 (12):12. [Medline]. [Full Text]. Beekhuis GJ. Nasal obstruction after rhinoplasty: etiology, and techniques for correction. Laryngoscope. 1976 Apr. 86(4):540-8. [Medline]. Parkes ML, Borowiecki B, Binder W. Functional sequelae of rhinoplasty. Ann Plast Surg. 1980 Feb. 4(2):116-20. [Medline]. Sachs ME. Post-rhinoplastic nasal obstruction. Otolaryngol Clin North Am. 1989 Apr. 22(2):319-32. [Medline]. Helal MZ, El-Tarabishi M, Magdy Sabry S, Yassin A, Rabie A, Lin SJ. Effects of rhinoplasty on the internal nasal valve: a comparison between internal continuous and external perforating osteotomy. Ann Plast Surg. 2010 May. 64(5):649-57. [Medline]. Pontell J, Slavit DH, Kern EB. The role of outfracture in correcting post-rhinoplasty nasal obstruction. Ear Nose Throat J. 1998 Feb. 77(2):106-8, 111-2. [Medline]. Goode RL. Surgery of the incompetent nasal valve. Laryngoscope. 1985 May. 95(5):546-55. [Medline]. Kasperbauer JL, Kern EB. Nasal valve physiology. Implications in nasal surgery. Otolaryngol Clin North Am. 1987 Nov. 20(4):699-719. [Medline]. Broker BJ, Berman WE. Nasal valve obstruction complicating rhinoplasty: prevention and treatment. Part II. Ear Nose Throat J. 1997 Mar. 76(3):130-2. [Medline]. Kocer U. Effect of aesthetic rhinoplasty on respiratory functions. Aesthetic Plast Surg. 2001 May-Jun. 25(3):202-6. [Medline]. Beekhuis GJ. Nasal septoplasty. Otolaryngol Clin North Am. 1973 Oct. 6(3):693-710. [Medline]. Gungor AA. The aerodynamics of the sinonasal interface: the nose takes wing-a paradigm shift for our time. Int Forum Allergy Rhinol. 2013 Apr. 3(4):299-306. [Medline]. Li L, Han D, Zhang L, Li Y, Zang H, Wang T, et al. Aerodynamic investigation of the correlation between nasal septal deviation and chronic rhinosinusitis. Laryngoscope. 2012 Sep. 122(9):1915-9. [Medline]. Ozlugedik S, Nakiboglu G, Sert C, Elhan A, Tonuk E, Akyar S. Numerical study of the aerodynamic effects of septoplasty and partial lateral turbinectomy. Laryngoscope. 2008 Feb. 118(2):330-4. [Medline]. Is the Evidence of Local Allergic Rhinitis Growing?